Badlands National Park, South Dakota. Deb arrived before dawn, and got the shot when the sun rose behind her and its glow hit the peaks. "I love the dramatic color combination of the clouds and the rock formations," she says. D800, AF-S NIKKOR 24-70mm f/2.8G ED, 1/2 second, f/16, ISO 100, manual exposure, Matrix metering. 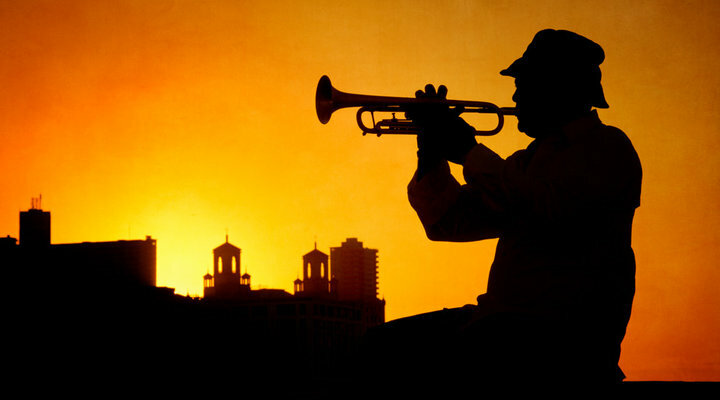 The setting sun silhouettes a musician playing on the Malecón, the esplanade along the Havana coastline. "That's the Hotel Nacional de Cuba in the background—I wanted the photograph to have a sense of place, a reference point for those who know Havana." D3S, AF-S NIKKOR 28-300mm f/3.5-5.6G ED VR, 1/160 second, f/22, ISO 200, manual exposure, Matrix metering. Sunrise, Thar Desert, India. "We were there before the sun rose and asked the drivers to arrange themselves and the camels to get that separation. I set the white balance to 4750° Kelvin to give the image a tranquil blue tone." D810, AF-S VR Zoom-NIKKOR 24-120mm f/3.5-5.6G IF-ED, 1/1000 second, f/16, ISO 400, manual exposure, Matrix metering. Taken 25 minutes after the previous image. Deb adjusted her position, changed the camera's white balance to Cloudy to bring a warmer feeling to the photo and zoomed the lens from 48mm to 78mm. "I wanted just a bit of the sun, and I stopped down a little to create the sunburst effect." D810, AF-S VR Zoom-NIKKOR 24-120mm f/3.5-5.6G IF-ED, 1/320 second, f/22, ISO 200, manual exposure, Matrix metering. In the Polhograjsko hills, near Ljubljana, Slovenia. Being there early was important; once the sun rose high in the sky, the light would be too harsh. But Deb still needed the graduated neutral density (ND) filter to keep detail from being lost. D810, AF-S NIKKOR 28-300mm f/3.5-5.6G ED VR, 1/15 second, f/11, ISO 64, manual exposure, Matrix metering. Sunset from Naples Pier, Florida, with the graduated ND filter. "It was so bright I knew I'd need it to balance the light. The shutter speed was just long enough to capture the movement of the tide around the pilings without losing the definition in the patterns in the water." Yes, the tripod was in the water for this shot; so was Deb. D810, AF-S NIKKOR 16-35mm f/4G ED VR, 1 second, f/11, ISO 64, f/11, manual exposure, Matrix metering. Sunrise, Lake Bled, Slovenia. "I’d seen this view while driving around one afternoon. I came back the next morning, in the dark, and found a spot that gave me an eye-level view of the church on the island. I used a graduated ND filter to hold back light at the top of the frame." D4, AF-S NIKKOR 24-70mm f/2.8G ED, 1/25 second, f/16, ISO 100, manual exposure, Matrix metering. Lake Bled, a year after the previous photo, a little earlier in the morning, right before the sun came over the horizon. "Revisiting the location rewarded me with a dramatic cloud formation." D810, AF-S VR Zoom-NIKKOR 24-120mm f/3.5-5.6G IF-ED, 1/15 second, f/11, ISO 64, manual exposure, Matrix metering. Sunset, Bell Harbor Marina, Seattle, Washington. "When you get this kind of color, you stick around and hope for a sailboat—and I got one. Take the boat away and there's no story." D810, AF-S NIKKOR 24-70mm f/2.8G ED, 1/40 second, f/5.6, ISO 400, manual exposure, Matrix metering. Melbourne Beach, Florida. Deb framed the image to use the canopy of trees and the foreground rocks as compositional elements, then waited until the sun slipped past the horizon. To play with color, she used a Singh-Ray Gold-N-Blue polarizer, which gives her control over a variety of colors by simply rotating the filter. A long exposure softened the look of the water. D810, AF-S NIKKOR 16-35mm f/4G ED VR, 3 seconds, f/11, ISO 64, manual exposure, Matrix metering. Sidelight at sunset casts beautiful patterns across the Palouse Hills at Steptoe Butte, Washington. "When the sun is too high in the sky, the shadows and patterns are lost, so it's best to arrive early and wait for the best light." To isolate a small section of the vast area, Deb used a long zoom lens. D500, AF-S NIKKOR 200-500mm f/5.6E ED VR, 1/250 second, f/11, ISO 400, manual exposure, Matrix metering. Sunrise, Tequesta, Florida. "Shutter speed was most important here, as I wanted to show the rush of the water toward the rocks as well as the golden glow hitting the clouds as the sun peeked past the horizon. The sun doesn't need to be in the photo to show its influence." D810, AF-S NIKKOR 16-35mm f/4G ED VR, 1/25 second, f/18, ISO 500, manual exposure, Matrix metering. Just after sunset at Melbourne Beach, Florida. "Catching both the afterglow of sunset and the pier lights makes for a more dramatic photo. A long exposure smoothed out the water." D810, AF-S NIKKOR 16-35mm f/4G ED VR, 30 seconds, f/11, ISO 64, manual exposure, center-weighted metering. Near Ljubljana, Slovenia. "He's a guide for travelers to the area. There was a storm the night before, and he knew that in the morning we'd have phenomenal shooting conditions. I asked him to stand out there—without him in the picture, it's not the same story." D810, AF-S NIKKOR 28-300mm f/3.5-5.6G ED VR, 1/200 second, f/11, ISO 64, manual exposure, Matrix metering. Sunrise over the lavender fields of Valensole Plain, Provence, France. "I wanted to show how the clouds were being painted in the sky over time. I used a 15-stop ND filter to hold back some light and an app called ND Timer to calculate the length of the exposure." D4, AF-S NIKKOR 16-35mm f/4G ED VR, 6 minutes, f/11, ISO 125, manual exposure, Matrix metering. The sunrises and sunsets are going to happen. It's what you do with them that's going to make the difference between photos you'll want to share and those you'll probably delete. The sun does not have to be the subject of the photograph. The effect of the sun on the landscape is often the picture. Plan or anticipate the picture you want to make. Give yourself the time and the tools to make it. The sunrise or sunset provides the lighting, but the success of the image will likely depend on what it's illuminating—and how it's doing the job. Rocks, docks, boats, islands, bridges, skylines—they're all good subjects for dramatic, beautiful sunrise or sunset photographs. Deb doesn't consider her sunrise or sunset pictures to be documents of captured moments. Rather, they're emotional reactions to what she's seeing, and often what she's envisioned or planned. Her images are interpretive and subjective; they are efforts to capture a feeling or a mood. For a professional photographer, they also represent the desire to make something different, unusual, notable and memorable. At a certain level of ambition and achievement, these photographs are not about simply capturing what's given. While it's possible to just notice a glorious sunset happening right in front of you, for the most part these kinds of pictures take some time, thought and planning. "For sunrises, I'm there, as a rule, about 45 minutes before it happens," Deb says. "I want to see where the clouds are or are likely to be. I'm going to set myself up to get the best shot before the sun peeks over the horizon. I don't want to shoot much past that point—once the sun's over the horizon, it's too intense. So it's the moments between darkness and sunup that are very important." For sunset images, it's a different approach. "I'm getting myself in the right position," she says, "but I'm looking at the quality of the sun's light as it changes, and at what's happening within the influence of light—how the light's affecting the scene." Deb prefers manual metering for these images, and she'll almost always set the f/stop first to control the depth of field. "Most often I want everything in the foreground to be sharp, and the details in the background won't be that important, especially if the background is in shadows—you won't see details anyway." The shutter speed is important when something in the scene is moving or might move and will result in a blurred image. If both depth of field and speed are keys to the photo, she can always push the ISO. The camera settings are based on what she wants to accomplish and what's most important to the story she wants to tell and the mood she wants to communicate. The idea is to decide on the scene's essential creative element and then use whatever's necessary to portray it. A key factor is to be at the location early, to make some test shots even if its too dark or too light—"just to be prepared, to be in the zone of evaluating, of judging what I see, and knowing what lens, what aperture, what filter I might need. And to have ready everything I need, because once the light begins to appear or fade, the changes will be quick and the opportunities fleeting." There's also the factor of revisiting a location. "There are places, like the Badlands in South Dakota, where the clouds are always going to change, where the dynamics will be different. I'll look for different angles or different ways to shoot. Same places, totally different conditions even at the same time of the year. Changes in weather affect the scene—there'll be wispy clouds for a quiet sunrise; other days, dramatic clouds for an intense scene. There are places I go back to for that very reason—to see what happens next." The sun doesn't need to be in the photo to show its influence. 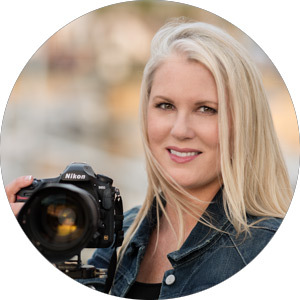 A tripod is essential for sunset and sunrise photos—Deb uses a Gitzo 82TQD Series 1 Traveler—and when the tripod's in use, chances are so is her Nikon MC-30A remote cable release. There are times, though, when the light's bright enough for the shutter speed to be fast enough for hand-held shooting. When she's looking to isolate a portion of the landscape in a sunrise or sunset image, the telephoto end of the AF-S NIKKOR 28-300mm f/3.5-5.6G ED VR will do that. When the goal is including as much sky as possible, her choice might be her widest zoom, the 16-35mm, or the 24-70mm. The versatile 24-120mm is also a go-to lens for sunsets and sunrises. Sometimes she'll match a DX camera, like the D500, with the AF-S NIKKOR 200-500mm f/5.6E ED VR and let the camera's 1.5 crop factor reveal details and emphasize the dramatic play of light and shadow. She will sometimes use a graduated neutral density (ND) filter— "especially if it's a long exposure, or to hold back the sunlight at the top of the image"—or a polarizer to cut down glare, or a color enhancing filter to add to the mood of a photo. And an invaluable app occasionally comes into play. The Photographer's Ephemeris will let you know times and locations for sunsets and sunrises, and, with an additional feature called Skyfire, forecast their intensity as well. If it's sunrises and sunsets you're after, it makes sense to know when and where the good ones are likely to happen. As Deb says, "I want to be sure I have all the tools I need to tell my story." Information about photo tours, workshops and events is available at deborahsandidge.com.